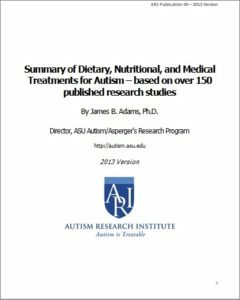 Dr. James Adams, professor at Arizona State University and co-chair of ARI’s Scientific Advisory Committee, recently published a comprehensive review paper, based on over 150 published references, on dietary, nutritional and medical treatments for those on the autism spectrum. This document is intended to provide a simple summary for families and physicians of the major dietary, nutritional, and medical treatments available to help children and adults with autism spectrum disorders. The discussion is limited to those treatments which have scientific research support, with an emphasis on nutritional interventions. This report excludes psychiatric medications for brevity. The dietary, nutritional, and medical treatments discussed here will not help every individual with autism, but they have helped thousands of children and adults improve, usually slowly and steadily over months and years, but sometimes dramatically. This summary is primarily based on review of the scientific literature, and includes over 150 references to peer-reviewed scientific research studies. It is also based on discussions with many physicians, nutritionists, researchers, and parents. This summary generally follows the philosophy of the Autism Research Institute (ARI), which involves trying to identify and treat the underlying causes of the symptoms of autism, based on medical testing, scientific research, and clinical experience, with an emphasis on nutritional interventions. Many of these treatments have been developed from observations by parents and physicians.